We will be focusing on how ‘civic action’ can allow participants to develop new skills, strategies and practices to directly affect changes in the city. Core to this is the idea of prototyping open source designs and rethinking organisational structures. Join us in building, making, testing new prototypes for civic action. We’ll be focussing on three different kinds of green infrastructure which address air quality, food waste and off-grid cooking. Come lend a hand or your knowledge. 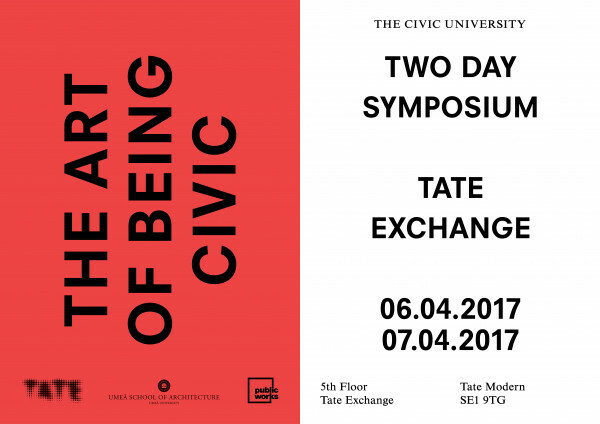 This one-day symposium curated by Sol Perez-Martinez of the Spatial Engagement Network, will explore ways to engage critically with our urban environment. Throughout three sessions participants will discuss spaces and methods proposed to foster meaningful relations between people and the places where they live. 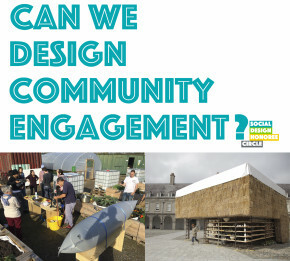 Ideas for Civic Action, will bring together practitioners, researchers and community groups who have worked connecting people with their surroundings in order to share practices and discuss further action. 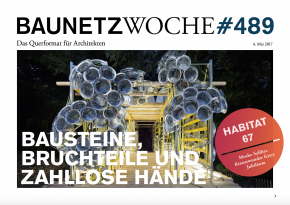 The event will showcase initiatives where architects have been aware of the social and political implications of their work, aiming to encourage a more conscious way of practice which serves community interests. Following the symposium, a final shared event in collaboration with Just Space, public works and Umeå School of Architecture, will discuss current projects where communities across London are taking action over their local areas and will draw conclusions from the day’s parallel events. 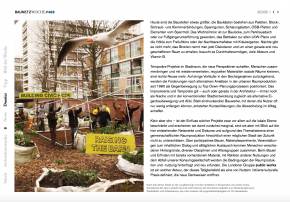 Pedagogies of the temporary. - Archives, Schools and the Temporary City. Join us for an afternoon session drawing a line of thought between archival practices and learning formats inspired by temporary use projects.Four speakers will present ideas, archives or projects opening up a view on the alternative learning spaces offered by temporary use projects and how this learning can be captured, passed on and mobilised in other forums.Taking as a point of departure the School of Civic Actions collaboration with Roskilde Festival, Northern Europe’s largest annual music festival and for one week every year, Denmark’s fourth largest city. Bringing the summer school to a close on site at R-Urban Poplar, we’ll be exhibiting all the prototypes built and tested over the previous week. Join our students in celebrating the schools hard work over a collective meal and reflective discussion. 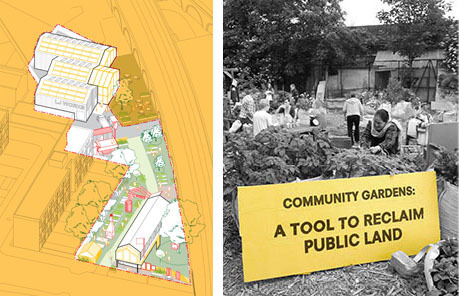 After working in Loughborough Junction for the past three years, public works, in collaboration with Architecture 00, are now working with local community organisations and Lambeth Council to use London Regeneration Fund funding to create 1,300sqm of affordable workspace that both safeguards an inspiring community growing project, The Loughborough Farm, and begins to address local youth unemployment. Within five years Lambeth will carry out a community asset transfer handing LJ Works to a local steering group, which public works is helping to establish, for the next 20 years. LJ Works is an experiment to test strategies for how citizens can reclaim ownership of public land. public works and 30 Bird bring together architecture, performance and science under the same roof. Home in the Service of Science is inspired by a year of conversations with scientists, cleaners, technicians, receptionists, security guards and the catering staff at the Laboratory of Molecular Biology (LMB) revealing scientific research and dialogue with LMB's everyday life. 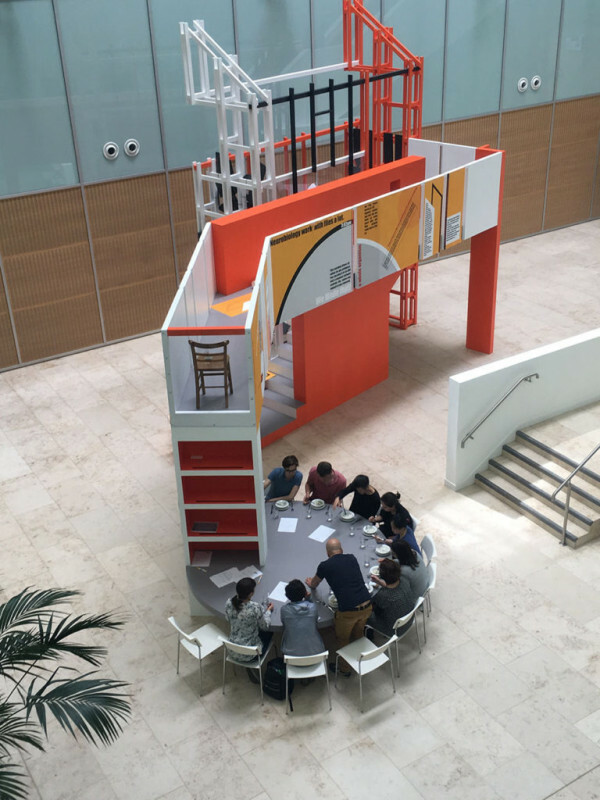 The residency centres around a structure made up of a bathroom, the space under the stairs, the parlour, the corridor and the study, sitting in the atrium at the LMB building and a series of dining room situation hostings. In an overwhelming context where we mainly build houses, the question of what the home is and what its role becomes is one to raise. As part of this Years Cambridge festival of ideas, Home in the Service of Science starts to raise such questions while thousands new homes are being built around the MRC building. public works and 30 Bird worked with the LMB staff to develop an interdisciplinary performance by visualizing and animating the weird and wonderful content produced during the residency such as mobile Ecoli factory in form of a toilet, worm tamer crown, an experiment in piano composition, and a fridge that breeds antibodies. All creating a jarring relationship between scientific experimentation and domestic living. The courgette based economy is up and running!!! 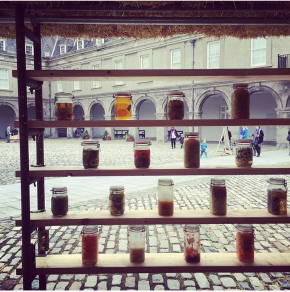 Really pleased to see the doors have fully opened and the courgettes are being harvested at our Glut Barn and Glut Field, our collaboration with Somewhere as part of ‘A Fair Land’, the flagship summer exhibition curated by Grizedale Arts for the Irish Museum of Modern Art (IMMA) in Dublin, Ireland. 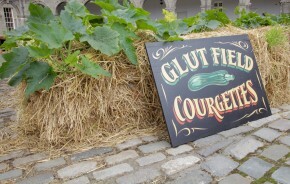 Glut Field is a large shallow raised bed directly onto the ground, made from straw bales planted with vigorous plants. Conditioned and planted directly with courgettes and marrows, quickly achieving foliar coverage and producing vegetables for the project's use, in quantity. The Glut Field was originally envisaged for the Mobile Garden City at Queen Elizabeth Olympic Park with the intent to create a productive conflict of having too much of one crop forcing everyone involved to become creative and generous with the single produce. 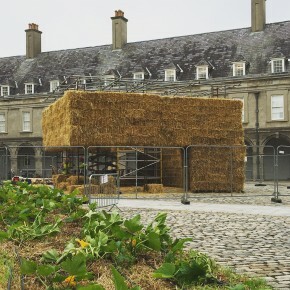 Its great to see it come to live as part of A Fair Land at IMMA. The Glut barn accompanies the field and serves as a cold kitchen to process the produce from the field. 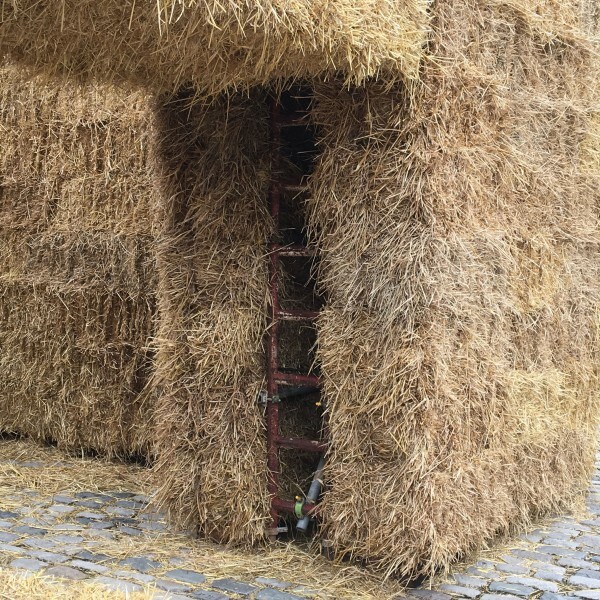 A magically floating straw bale building easily accessible at ground level for all to join in producing and making. Envisaged, enabled and operated by a collective creative vision A Fair Land looks at how self- determination and dignity can be delivered through the inherent human function of creativity, and how its use in the everyday is a means to enable change and empowerment. 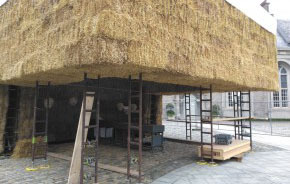 This project aims to develop a system for living derived from basic and simple resources used in a creative way. 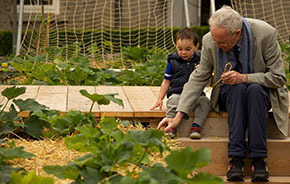 To this end a project village has been created to offer its visitors opportunities to eat, make, think or trade – and through that process to learn, copy, assimilate and teach. 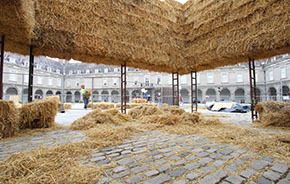 With a focus on creating objects that are useful, desirable and achievable, A Fair Land will present an active and tangible representation of the place of creativity in society, creating a space for families, friends and strangers to gather, get involved, and experience alternative perspectives on living. A Fair Land has been developed by a wide range of people, with the aim of making a new vision for a functioning future society. 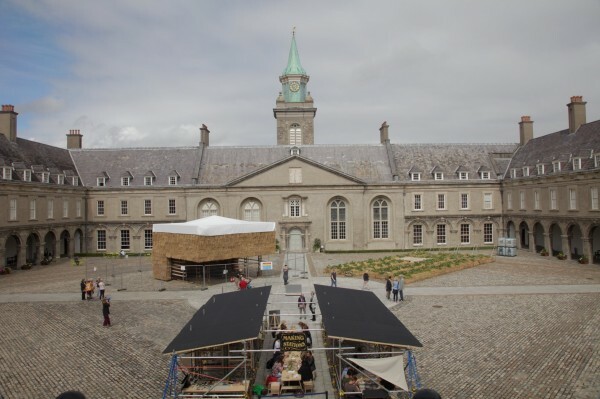 Artists and Collaborators include: Eavan Atkin / Samuel Bishop / Kat Black / Tania Bruguera / Rhona Byrne / Marcus Coates / Emily Cropton / CREATE / Coniston village building team / Michelle Darmody / Drew and Middori / Motoko Fujita / Ryan Gander / Liz Gillis / Nicola Goode / Irish Architecture Foundation / Brenda Kearney / Suzanne Lacy / Renzo Martens / Jonathan Meese / Meg Narongchai / Deirdre O’Mahony / Seoidin O’Sullivan / Debbie Paul / Niamh Riordan / Kirsty Roberts / Katie Sanderson / Sarah Staton / Francesca Ulivi / Miranda Vane / Fiona Whelan / public works / NÓS Workshop / NVA / Somewhere / Sweet Water Foundation / Villagers from the Swiss village of Leytron / Tom Watt & Tanad Williams, and many more. Come visit and get hands on involved! See the full programme here.